SSRIC Conference in Long Beach, CA. As part of co-curricular work, several students presented research in competition or participated in professional conferences. The department helped students defray some, and in many cases, all of the travel expenses for 18 individual trips. Matt Klepfer presented a paper and participated in a making and doing session at the Society for the Social Studies of Science conference in Boston. 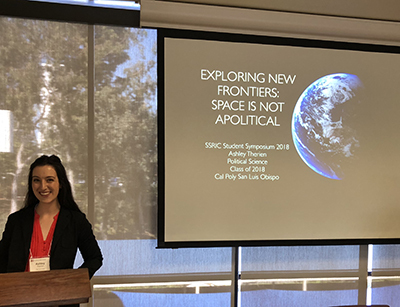 He also attended the 13th annual Engineering, Social Justice and Peace Conference at the University of San Diego as part of the research for his senior project. Juan Ortiz attended the 2018 International Studies Association Conference in San Francisco and participated as the one representative from California in Congressional Visit Days. Mick Bruckner participated in the 2017 UMASS Queer Studies Symposium in Amherst. Ellie Lupo, Annie Campbell and Erin Chazer attended the 2018 California Democratic Convention in San Diego. Abibat Iriafen traveled to Atlanta to participate in the Humanity in Action Fellowship. Dezeray Cruz traveled to Madrid, Spain, as part of the 2018 Lex Fellowship cohort. Annie Campbell traveled to Washington, D.C., to intern with U.S. Rep. Salud Carbajal in spring 2018.